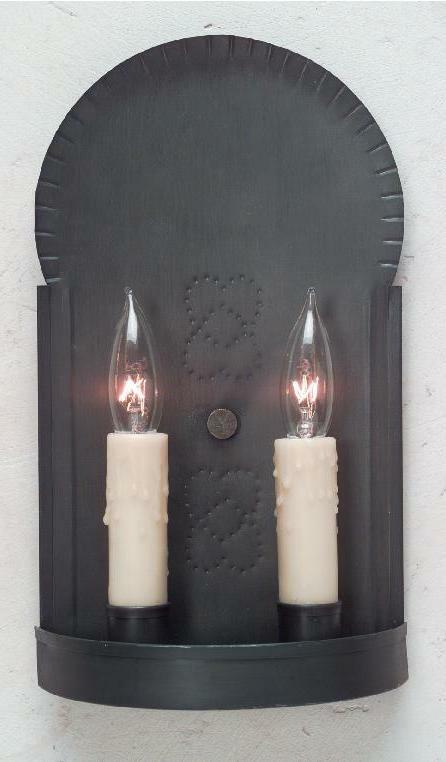 Add instant charm when you buy Hammerworks our Vintage Colonial Tin Sconces Model S120! First and foremost these classic country style Colonial Wall Sconces add an attractive yet practical accent to any space. With two candles each rated for up to 60 watts they emit plenty of light. Therefore add a Colonial Tin Wall Sconce pair to a dark hallway. Or perhaps you need lighting over the bed where space for a bedside lamp is limited. No matter what if you prefer an alternative to antique tin, we offer both antique brass and copper. Thus you have versatility in coordinating with the color scheme and style in any room. Furthermore the design of the S120 Wall Sconce coordinates especially well with the Rustic Tin Wall Sconces S129. No matter which style you choose each Reproduction Tin Wall Sconce is beautiful in its’ simplicity. With sizes and styles ranging from small and simple to large and formal our selection of Colonial Wall Sconces has something for everyone. Therefore whether you have an Antique Reproduction, New England Farmhouse, Formal Colonial home we offer a Rustic Style Wall Sconce that is perfect. From the simple Early American Brass Wall Sconce S101 to the formal Colonial Williamsburg Wall Sconce S140 the possibilities are endless. While our Antique Wall Sconces add charm to the overall design of any setting, proper placement is important. Thus, always consider height as well as room location. Therefore install your Colonial Reproduction Wall Sconce at the correct height level when coordinated with artwork or above fireplace mantles. In addition an area behind a chair or sofa or over a desk is an ideal location. Finally, no matter the size or style Colonial Wall Sconces you are shopping for our exceptional craftsmanship shines through.